The Sega Mega Drive - or Genesis, if you're of the North American persuasion - may be a vintage system in the eyes of modern players but that doesn't mean it can't get new software. With that in mind, say hello to Tanglewood, a new action-platformer which is currently in development for Sega's legendary 16-bit console. 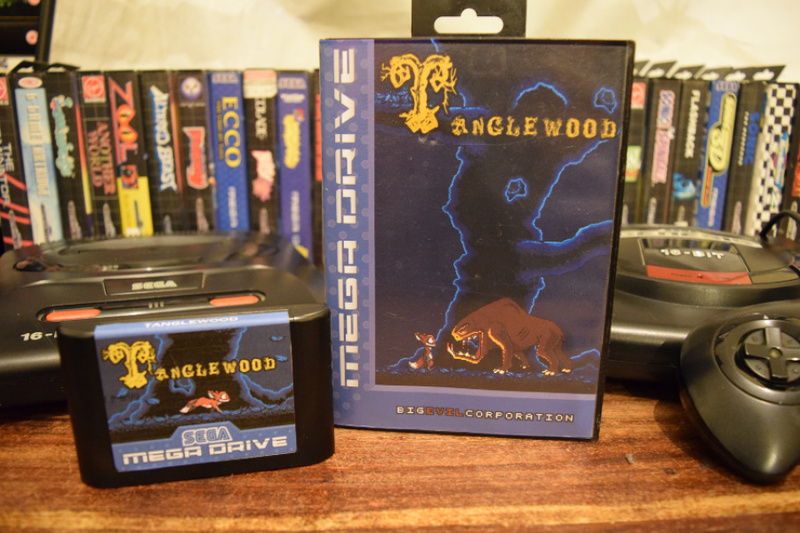 Described as a mix between Another World, Flashback, Sonic the Hedgehog, LIMBO, Ori and the Blind Forest, Abe's Oddysee and Heart of Darkness (phew), Tanglewood is being developed using the original tools Sega supplied to devs back in the day. It will launch on a multi-region cartridge which will be playable on any Mega Drive / Genesis console, and is also coming to PC and Mac. Developer Big Evil Corporation is seeking £48,000 to create the game, and has raised almost £8,000 at the time of writing. A demo - which can be downloaded to a Mega Drive flash cartridge - is available now. Erm, and this is Nintendo News, why? Looks interesting. At least there is a demo to try. @Bunkerneath Because Sega does what Nintendon't. looks fun, but I don't trust kickstarter campaigns. Hope it does well though. It looks alright, definitely a game I would play. Wish it was on the current systems though. I'd buy that for a dollar!!!! Just in time for the world-wide relaunch of the Genesis! My guess would be that the slight overlap is on purpose, in order to add a slight feel of perspective. You see a similar thing in quite many 2D games both from the 16 bit era and later. @Pod Could be, but if you look at the entire trailer, then this is not something that they do consistently. You can even see the difference in the beginning of the animation I posted, when he is standing on top of the branch, and in the trailer when he's walking on other surfaces, he's also not walking "in" them, but on them, like it should look. This to me looks like it still needs quite a bit of polish. I choose to believe they aren't at all aiming for it to look like you say it should look. It'd be almost impossible to completely eliminate overlap anyway, considering the curvy branches in the trailer. I personally wouldn't consider this thing on the list of concerns for the polishing, if I was making this game. @Pod Don't get me wrong, I'm not trying to be overly critical of this game, but the fact that I immediately noticed it, tells me that I haven't seen it before in similar games, or they just used better ways to implement it or even hide it so it isn't as noticeable. You might find a similar thing can be seen in quite many games from the period. A very notable example being the ever famous Lion King on Genesis, which also does pull it off considerably better. Many 2D games feign a little bit of perspective in many ways, to get the visuals more interesting than having characters in stark profile directly on top of flat surfaces. What might look off about Tanglewood in particular to you is that the characters are indeed rather dead on profile, whereas Simba is drawn nicely dimensional, seen at a big of an angle from the front, to get more depth and personality. @Pod That's exactly what I was talking about: the implementation of it is better/smoother, or they mask it better by playing with the graphics and the surroundings, which is why it isn't as noticeable. But like I said in my original comment: this game probably is in early stages, so they might improve on the surrounding graphics to also achieve that level of letting it stand out as much. A huge bulk of the primary animations seem rather finished and fluid, so redoing them or modifying them might not be something they're considering with the budget they're seeking. But yeah, it would be lovely if they got the time to refine this kind of thing, as their characters look adorable, and you'd feel like you got closer to them. @Pod Yeah, I like the overall look and feel of the game, and funny that you linked to the Lion King, since I was also reminded of that. Just a bit of polish and some spruced up scenery is all it needs. It is still looking kind of empty now. A few little touches here and there could do a lot to improve upon it.